The range of interests in energy related activities across the U.S., including research, planning, response, assessments, etc., highlights the need for web mapping applications capable of meeting this broad array of user needs. Geocube was developed to fill this gap by providing a highly customizable, flexible web mapping application that concatenates commonly used spatial data and information into an application that supports a variety of technical users and purposes. Geocube connects users to data and information spanning the subsurface to the surface via Energy Data eXchange (EDX), integrating its online search capabilities and from current data feeds. Users can create and download custom maps consisting of spatial elements of interest. 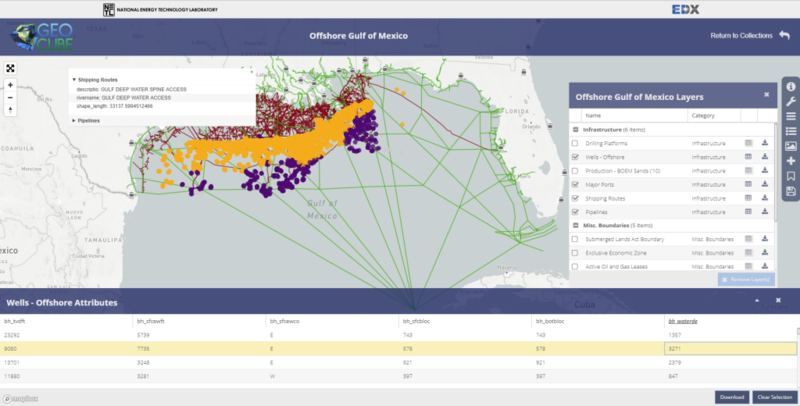 The initial Geocube release focuses on the offshore Gulf of Mexico (GOM) region and supports NETL’s GOM Integrated Assessment Model (IAM) risk assessment for the Gulf of Mexico deep and ultra-deepwater offshore. Geocube supports NETL’s offshore GOM IAM risk assessment by integrating numerous spatial datasets to view and analyze the components of the offshore Gulf of Mexico hydrocarbon system including subsurface geologic characteristics, oil and gas infrastructure, water column characteristics, and numerous human marine and coastal activities (tourism, recreational and commercial fishing). Geocube is updated regularly with additional data layers and functionality as NETL research progresses.